One of the biggest novelties that have appeared on the Polish market in the last two years are polyphenol oils originating in Crete and Greece. Last year, we wrote about them twice, but they are still little-known and recognizable products in Poland. For us, this topic has become very interesting, so we decided to look at it even closer. Therefore, we publish further information on polyphenol oils, focusing mainly on the excellent oil Eliama Gold produced by Elli's Farm in Crete. When writing this article on substantive issues, we also consulted Dr hab. n. med. Gretą Wozniak, a clinical neurophysiologist at the Faculty of Medicine of the University of Cyprus in Nicosia, who is one of the best experts on this subject. A good opportunity to get acquainted with polyphenolic oils was last year's Greek Panorama in Warsaw. At the stands of several producers it was possible to taste and purchase these unusual products. The oil available at the Eliam's booth was particularly interesting, where the attention of the visitors was attracted by the unusual installation. It was made of the trunk of an 800-year-old olive tree, which was struck by lightning. For such beautiful and valuable wood to not be wasted, one of the pieces of the trunk was used by the owner of the company to create a very suggestive work. From the inside of the trunk oil spilled out, which metaphorically depicted olive oil as a source of life flowing straight from the interior of the olive tree. The installation itself is not everything. It is also worth paying attention to the symbolic overtone which is the name of the Eliama company. It consists of the joining of two words: El or ellas-Greek, IAMA - medicine, food. It is difficult to give a more vivid emphasis on the health properties of this oil. First of all, it is worth knowing that polyphenols are very common in edible plants and various types of beverages. Some vegetables and fruits, cereals, nuts, legumes as well as tea, cocoa, wine or beer are popular products with which we provide our bodies with polifeonols in our daily diet. However, it is worth bearing in mind that the level of these compounds differs not only depending on the category of food, but also within it. Even factors such as genetics, the degree of fruit and vegetable maturity, processing and storage are affected. Olive oil is also a product in which polyphenols can occur in very different concentrations. Therefore, it is necessary to distinguish between polyphenol oils and ordinary extra virgin oils, as they differ not only in the significant level of the concentration of these substances but above all the intended use and the recommended daily consumption limit. They are organic compounds classified as a group of phenols. Depending on their basic chemical structure, at least 15 classes can be distinguished, one of the largest and best known flavonoids. There are 13 subcategories within the class of flavonoids, with a total of over 5,000 different substances. In olive oil, however, are contained phenolic acids and hydrolysed tannins, which constitute a "polar fraction" preventing its self-oxidation. In this way they give thermal stability and contribute to its characteristic taste and aroma. The oil contains the following polyphenols: hydroxytyrosol, tyrosol and its derivatives, oleocanthal, oleacein, oleuropein and ligstroside. Among them, the greatest health effects are characterized by oleocanthal, oleacein and oleuropein. It has been proven that these compounds have antioxidant, neuroprevention, anti-inflammatory and antithrombotic activity. Polyphenol oils are recognized in the European Union as medicinal products , and their producers can use so-called Health Claim sign. According to the European Commission Regulation No. 432/2012, these oils must contain a sufficient amount of substances having a health-promoting effect. The average values specified in this regulation are 135 mg / Kg for Oleocanthal and 105 mg / Kg for Oleaceina. Of course, in order to be able to use the Health Claim label, the producer must undergo detailed analyzes for each batch of oil. The purpose of these tests is to check the level of polyphenols, the amount of which can fluctuate. The variety and geographical origin of olive trees, the stage of ripening, the degree of irrigation and climatic conditions modulate the polyphenolic composition of the oil. European Commission Regulation No. 432/2012 (EFSA 2011; 9 (4): 2033) also informs that in the case of polyphenolic oils their beneficial effect occurs when in a daily diet we consume at least 20 g of such oil. It is worth knowing, however, that polyphenol oils can not be consumed without moderation. The recommended daily dose is 40 mg (50 ml). Its size was determined on the basis of clinical trials conducted, according to which polyphenols administered in such quantities show their chemopreventive, anti-inflammatory and protective effects in neurodegenerative diseases. The wide range of health benefits that can be obtained through long-term consumption of oil is attributed mainly to its phenolic fraction. Many of the substances contained in the oil have been studied since their discovery, for example, hydroxytyrosol. In the last decade, Oleocanthal attracted the attention of scientists, considered nowadays as a potential therapeutic agent against neurodegenerative diseases, cardiovascular and cancer. Oleocanthal is a phenol with a strong anti-inflammatory effect comparable to Ibuprofen. Because many chronic diseases, such as cancer or Alzheimer's disease, have a hidden inflammatory and oxidative base, oleocanthal is a promising preventive measure against these diseases. This is confirmed by recent research conducted by the US National Institutes of Health. They show that consumption of polyphenol oil with a very high concentration of Oleocanthal weakens the development of the early form of Alzheimer's disease, as well as in the primary and secondary syndrome of symptoms of multiple sclerosis. Other extensive studies concerned his anti-cancer activities. Oleocanthal has been found to inhibit the development of melanoma, colon, breast, liver and colon tumors. According to the latest research, Oleocanthal is also effective in the treatment of rheumatoid arthritis. In the polyphenol oil, the other substances included in it also play a significant role. Medical scientific research confirms that in addition to oleocanthal, oleacein and hydroxytyrosol, as well as oleuropein, have a beneficial effect on the lipid profile, reducing the content of triglycerides in the blood, total cholesterol, VLDL fraction and LDL called "bad cholesterol". Its excess leads to the deposition of atherosclerotic plaques in the blood vessels and the development of atherosclerosis. Regular consumption of such an oil therefore reduces the risk of coronary heart disease. These health effects are obtained by reducing platelet aggregation and regulating blood pressure, which directly counteracts the formation of blood clots. Another very important action of these substances is the protection of lipids in the blood from the effects of oxidative stress. It comes to him in situations in which the body has an insufficient advantage of antioxidants over oxidants. Excessive production of free radicals means that the body can not cope with their neutralization and repair of damage caused. In the long term, oxidative stress leads to the mutation of cells, because excess free radicals damage DNA, cell membranes and enzymes. As a consequence, it leads to the development of diseases such as atherosclerosis, cancer, Parkinson's disease or Alzheimer's disease. It is also worth noting that these compounds also help in the fight against inflammation and ulceration of the stomach, gallstones and constipation. Studies on the effects of these substances in the prevention and treatment of pancreatic cancer have also been conducted. Some people probably ask themselves whether it would be simpler to swallow polyphenol tablets as popular dietary supplements are served. Research on the "golden treasure", as it is called oil and its properties, has been going on for many years. Oleocanthal was first discovered in 1992. There have even been attempts to extract oleocanthalu and oleacein for use in pharmacology. Unfortunately, it turned out that the problem that can not be overcome at present is the distribution of these phenols occurring during their extraction. Re-synthesis of these compounds is very complicated due to their instability in the aquatic environment. In addition, polyphenols in this form have low yields and do not have such preventive properties as those found in the natural state. In addition, oleocanthal and other compounds contained in natural olive oil acting synergistically strengthen each other's therapeutic effect. So far, there is nothing other than regular and long-term consumption of high-phenolic oil to provide these valuable compounds and strengthen organisms. Olives are harvested during the so-called early harvest, ie around November. Particular attention is paid to the ambient temperature, which during harvest should not exceed 12 ° C. The lower it is, the better for the harvest. For the pressing of this specific olive oil, unripe green olives are harvested, whose weight does not exceed 1 gram. Manual harvesting allows first of all for the maximum reduction of the occurrence of potential damage, which inevitably arises during the mechanical harvesting of olives. Damage to fruit causes the development of inflammatory states of fruits that worsen the quality of the oil being pumped. Hand picking olives and their meticulous selection to meet all the standards guarantees that only the best fruits will be available for pressing. After harvest, the olives go to certified containers adapted to food storage, which are then immediately placed in cold stores. The 5 ° C temperature prevailing in them prevents the development of inflammation in the collected olives. The production of the Eliama Gold oil is characterized by a very short time that separates the moment of harvesting the olives from the moment they are pressed into the oil. In this case, it is very short and does not exceed 4 hours. For comparison, ordinary extra-virgin olive oil pressed for various "network" brands can be obtained on average after an hour, or even after 2-3 days from the moment of harvesting the fruit. It is worth knowing that producing 1 liter of high-polyolenic Eliama Gold oil requires collecting as much as 36 kg of olives. For comparison, 1 liter of "ordinary" extra virgin olive oil is pressed from about 8 kg of olives. After extrusion, the oil is stored in special tanks made of stainless steel, specially adapted for storage of this type of product. To protect the oil against atmospheric oxygen, the cisterns are protected with nitrogen. This action significantly reduces the phenomenon of oxidation of the oil and thus allows to counteract the loss of valuable components that are contained in it. The necessary step in the production process of this type of oil is the determination of the amount of polyphenolic compounds, namely hydroxytezol, tyrosol and its derivatives: Oleocanthal, Oleacein, Oleuropein and Ligstroside. The content of each tank is analyzed both at the beginning of the harvest and later. At the storage stage, the composition of the oil is tested every quarter. It is also worth paying attention to Eliama's packaging. To consumers, this oil goes in dark glass bottles, which are completely sprayed with white paint. This is one of the best ways to protect the oil from the rays of light, which are one of the reasons for losing its valuable values. The total amount of polyphenols in 1 kilogram of oil: 1 197 mg / Kg. These values are much higher than the averages defined in EU Regulation 432/2012. The daily consumption of only 20 g of this olive oil provides as much as 23.9 mg of hydroxytyrosol, tyrosol and derivatives, and the average specified in the EU regulation is only> 5 mg per 20 g. This means that in Eliamie Gold the level of these polyphenols is over 4 higher than the established European standards. Thanks to this, it is included in the group of the best polyphenolic oils. Polyphenol oils are intended only for cold consumption. Heating and high temperature destroy valuable polyphenols, so you should neither cook nor fry dishes on it. At the most, the dish prepared on the plate can be used for this kind of oil. However, if you do not want to lose even a drop of this oil, it's best to just measure it and drink it directly. In this case, you must be prepared for its extremely bitter and burning taste, which shows that it is rich in polyphenols. A cough may be a natural instinct to such an experience. Despite the sharp taste, there is nothing to worry about irritation of the mucous membrane of the throat. The piquancy of olive oil does not add capsaicin, but mainly oleocanthal. Today we have prepared an article for you about polyphenol oils, which are still relatively unknown products on our market. 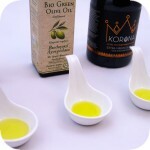 You will also find there the reviews of two excellent oils of this type: Bio Green and Crown. The fact that the Mediterranean diet is healthy has been written many times. Scientists are systematically conducting various studies on the effects of this diet on human organisms. In recent weeks, the results of studies have been published, the subject of which was the impact of the Mediterranean diet on the level of sugar in the blood. So what do the Greeks eat that their diet works in such a beneficial way? Tomatoes are one of the extremely popular ingredients found in the daily diet of the Greeks. They are rich in vitamin C and lycopene - an antioxidant that contributes to good health. Research shows that tomatoes have phenomenal cancer protection capabilities.